I came across this snout heavy insect earlier in the week while looking for Clavate Tortoisebugs (another post) with a couple of my esteemed colleagues. 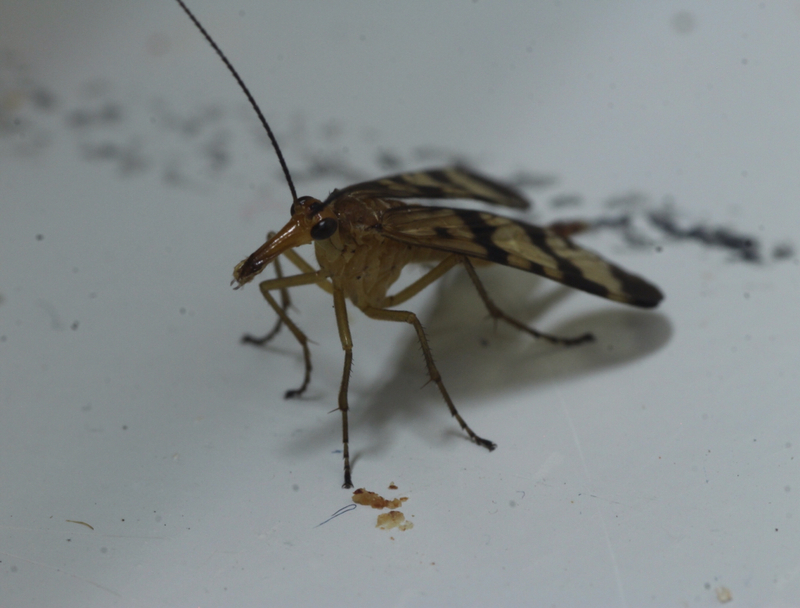 We turned up a number of interesting insects including this Scorpionfly, (Panorpa sp). 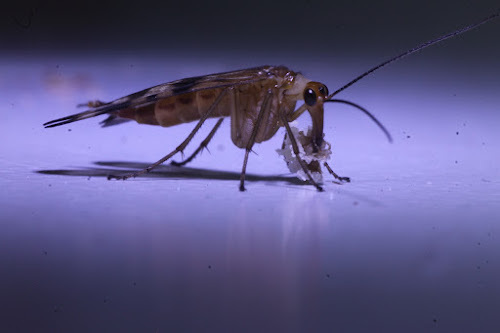 Scorpionflies are in the order Mecoptera which includes an assortment of oddish fly-like insects that also includes the Hangingflies and Snow Scorpionflies. Despite the resemblance to flies they are not, taxonomically speaking, flies. Flies, along with mosquitoes, gnats and assorted others are in the order Diptera. Mecopterans have four wings, while Dipterans have two wings. Mecopterans have chewing mouth parts, Dipterans have sponging mouthparts. Given the unusual head shape I thought there might be something interesting to learn about their feeding habitats, but I couldn't discover anything specific to explain the elongated snout. As mentioned, they have chewing mouthparts with small appendages at the end of the snout, or rostrum, for holding and chewing their food. They are omnivores, but according to most descriptions, feed primarily on dead and dying insects. 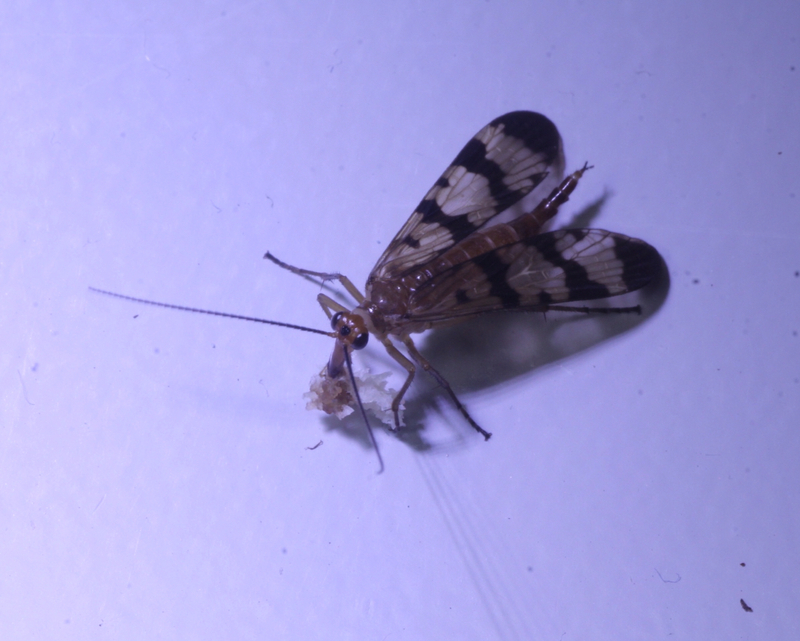 The scorpionfly I photographed escaped while I was examine it inside and found a doughnut crumb to feed on, which you can see in photo one and three. It seems to me that such a distinctly shaped head would have some significance in how they feed, but I could find nothing to specific. Most descriptions of scorpionfly focus more on the stinger-like abdomen of the males, which is harmless and used during mating, and which gives them the common name scorpionfly. And their behavior during mating which often includes a gift of dead insects for the female - or a glob of edible spit. Or maybe a doughnut crumb.